I love this wallet. Anytime anyone notice it they comment on how cool is is. Thank you, and keep making great products. This one right here is amazing. I don’t have a comb to fit it yet but it holds my cards as said. 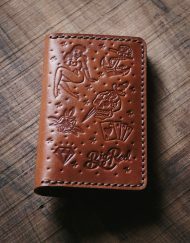 The quality of leather is good as other products the stitching is on point. Very well put together. the most beautiful in the world ! and they are the best ! 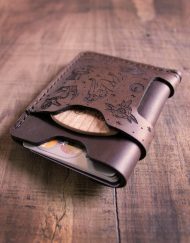 This wallet is awesome!!! 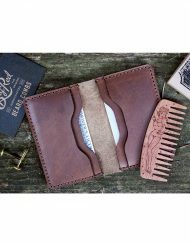 Fits my front pocket and beard comb perfectly!! Love the embossed old school tattoos that are on both sides. 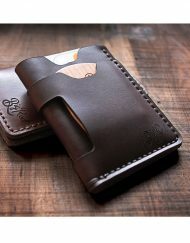 The leather and craftmanship are top quality! I love this wallet, it’s small so it fits i my front pocket. The design look great and the stitch work look good so far. 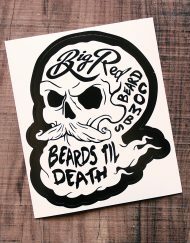 I can carry 3, maybe 4 cards, alot of bills and og course mye big red no 5. Thanks for an awesome product. 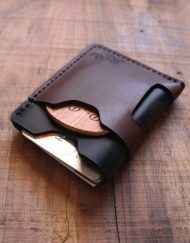 Once you try this small wallet, you’ll never buy a regular wallet again. Plus this one looks awesome. Nice work on the design. Keep up the high quality products. 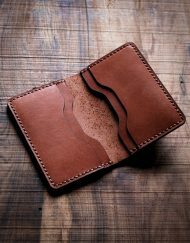 I bought this wallet for my husband for Christmas and he was out of his world when he saw the wallet he said : Wow this is exactly want I needed it’s , manly, small , and smell like a new couch !!! 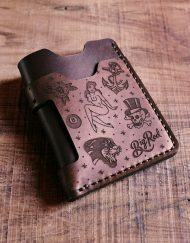 Amazing wallet, shipping was a few days and it looks IDENTICAL to the photo’s. Everyone asks about it here in Northern Ontario! 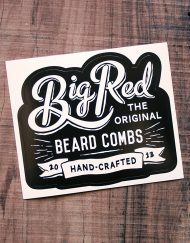 Great work I’ll be ordering the No5 comb soon!! 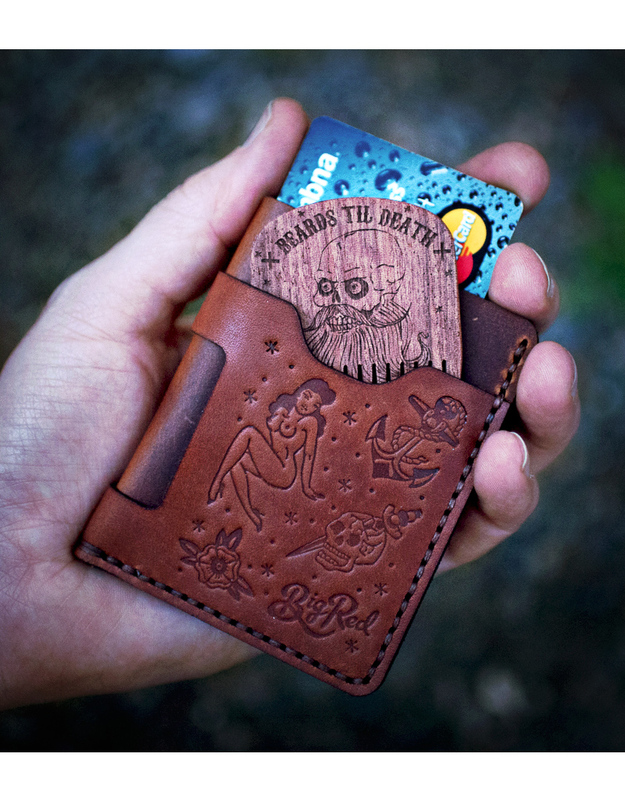 Wallet is great, Just the right size to fit in my front pocket. Holds all the cards and stuff i need. 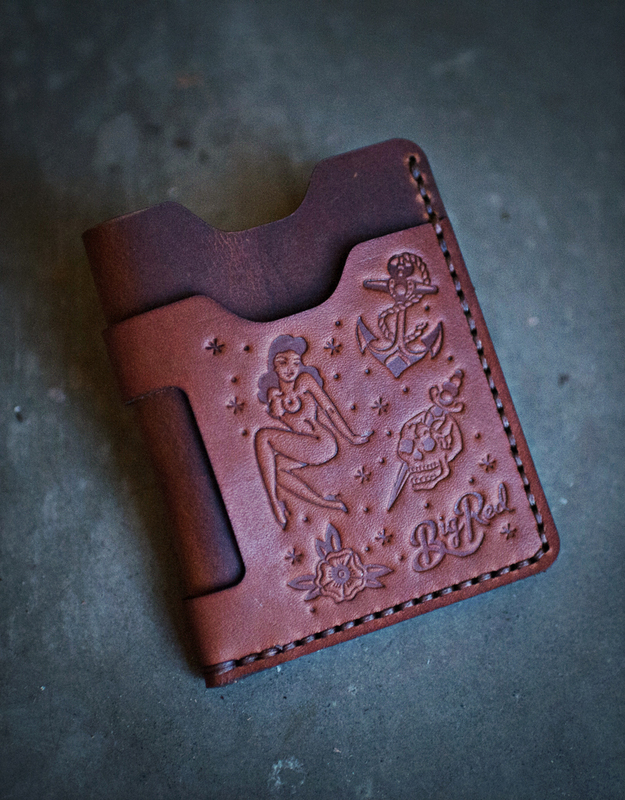 The craftsmanship of the wallet is top flight. Identical to the picture, the quality of the leather is fantastic and the delivery time was excellent! You won’t regret buying this product!! 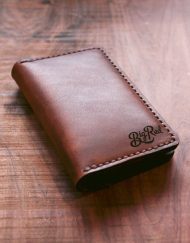 I am 100% satisfied with the wallet. 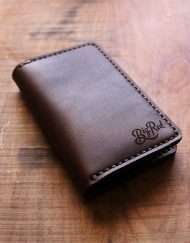 I receive a ton of comments about how people love the wallet. plus the fact I get to carry my beard comb in it is awesome. Thank you for the awesome quality products you produce. 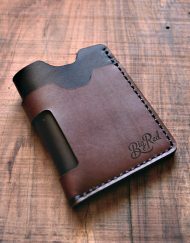 I love the slimness of this wallet. You can fit everything in and it is not bulging in your pocket. In addition to comb, small pocket is perfect for condom. I would personally like little bit wider teeth, when beard happens to be too curly, it can get stuck. On the plus side, I love the design and smallness of it. You can carry it pretty much everywhere, in pocket, in wallet, in phone case etc. It also feels very strong, your are probably not going to break it by accidentally sitting on it. It is so cool! I love it and hope that my husband do too, its for our anniversery in june. Killer look and killer feel to whipping out my wallet. It’s slim enough to put in a front pocket when your out for the night. Brbc does it again. This company is about nothing but top quality goods. Every time I whip out this bad boy everybody wants to know where it came from, including old ladies. Everything about it is f*cking beautiful from the stitches to the smell of real dead cow. 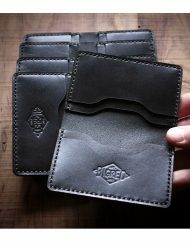 Top qualité, les cartes tiennent très bien et n’ont pas tendance à tomber, le cuir est de qualité et les coutures semblent être faites pour résister des années. Impossible d’être déçu! Le peigne #5 est son compagnon idéal! I just received my wallet! I was very excited to finally get it. It looks great and I ordered a No. 5 to store in it so I can have it with me when I’m out and about. I love how slim it feels and how soft it is. 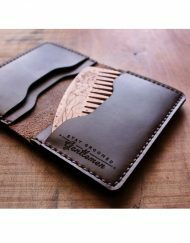 I really thought I might have to break it in, but in fact, it’s super soft and easily manipulated to slide in your comb, cards and any bills. They won’t fall out of it from being so soft either, making it even better! 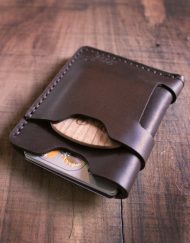 You won’t go wrong with this wallet if you’re looking for something minimalist in nature.